· RESERVATION DEPOSIT – a reservation deposit of half the rental is required to confirm any reservation. The balance of the total reservation amount is due and will be charged to the Guest, 30 days prior to the arrival date. All payments made are non-refundable for any reason.
. TRAVEL INSURANCE - we now offer travel insurance, for those unexpected travel interruptions, you can click on the following link, if you are located in Canada, please email us and we will assist you with a mailing address that you can use to complete the application. IMG Travel Insurance. · SPECIAL CIRCUMSTANCES – “holiday reservations”, those occurring between December 15 and January 10 of any year, require full payment to confirm the reservation and all monies are non-refundable for any reason. - Theft of personal or real property. - Damage to the property or the contents of the property. Guest is financially and legally responsible for all damage to the property. - Exceeding the maximum allowed occupancy as stipulated in the reservation contract. - Smoking inside the property. - Pets on property, unless prior arrangements are made. - Parties or gathering of excessive amount of people. Only the number of persons on the reservations are allowed in the home. - Maintaining hazardous, poisonous, corrosive or flammable substances. - No kids under 6 years of age in the hot tub, all children under 12 years of age must be accompied by an adult to use the pool / hot tup. - Bathrooms - only toilet paper and bodily discharges are to be flushed in the toilets. Use trash can for all other items. · SUBSTITUTION – Guest acknowledges and understands that should the property become unavailable for any reason during the Guest’s agreed upon occupancy, VDC Reserves the right to relocate the Guest to the best available and comparable property or Guest has the right for a full 100% refund of all monies paid if an agreement cannot be reached between the Guest and VDC. The rental rate will not be adjusted due to any malfunction of equipment. REPAIRS - Even the best or newest equipment occasionally malfunctions and cannot be guaranteed 100% of the time. VDC uses the best maintenance personnel available. Problems are corrected as soon as possible. Agent or an authorized employee or repairman may enter the premises during business hours for any purpose connected with the repair, care or maintenance of the premises. Refunds will not be issued due to malfunctioning equipment or other guest dissatisfaction. Cerritos Beach is a highly desirable developing resort area with houses under construction. We do not move people or give refunds due to construction noise. · LIABILITY AND INTENT –Neither VDC nor the owner of the property shall be responsible for any accidents or injuries to Guest before, during or after occupancy. VDC, its owners and agents are not responsible for theft, lost or stolen items. Furthermore, neither VDC its employees, agents or the Owner bear any liability for accidents, injury or other which may occur during any outside hired activities, recommended or not by VDC or its employees; to include but not limited to Restaurants, Tours, Excursion or other activities. Mexico does not conform to the United States' American Disabilities Act standards and, therefore, facilities for disabled persons are extremely limited in Mexico. please contact a reservation host for specifics. To enter Mexico, you must have a valid U.S. / Canadian, or other Passport. This applies to children, toddlers, and infants. • All U.S./ Canadian citizens must also carry a Mexican Tourist Card, which is supplied by the airline carrier. 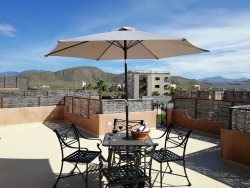 By booking a MEXICO vacation with Villas de Cerritos Beach, you acknowledge and agree that the venue for any dispute or claim that you may wish to make regarding vacation arrangements made by VDC shall be made in the country of Mexico, in the jurisdiction of La Paz, Baja California Sur. **Information on this website is accurate to the best of our knowledge. We are not responsible for any typographical errors on the website.